Dive right in and do something amazing with your videos. Auto-generated photo and video slideshows and collages are created just for you and delivered upon launch. See what’s new since your last version, discover fun things to try, and get inspiring ideas, help, and tutorials in the new home screen. Effortlessly edit and create thanks to Adobe Sensei AI technology. * Easily make movies in the redesigned Quick Edit mode, which offers a simplified Sceneline that puts everything at your fingertips. Get step-by-step help with 20 Guided Edits, and share animated GIFs, video collages, slideshows, and full-length movies. Dive right in and do something amazing with your videos. Auto-generated photo and video slideshows and collages are created just for you and delivered upon launch. Get up and running quickly with the new home screen—see what’s new since your last version, discover fun things to try, and get inspiring ideas, help, and tutorials. Effortlessly edit and create thanks to photo and video automation powered by Adobe Sensei AI technology. * Easily make movies in the redesigned Quick Edit mode, which offers a simplified Sceneline that puts clips, transitions, text, effects, and more at your fingertips. Try artistic techniques and effects with 20 step-by-step Guided Edits. And share your favorite memories in everything from animated GIFs and video collages to dynamic slideshows and full-length movies. *Adobe Sensei is the technology that powers intelligent features across all Adobe products to dramatically improve the design and delivery of digital experiences, using artificial intelligence and machine learning in a common framework. • Beautiful photo and video slideshows and collages are created just for you and delivered upon launch. It’s all powered by Adobe Sensei AI technology. • Get up and running quickly with the new home screen. See what’s new since your last version, discover fun things to try, and get inspiring ideas, help, and tutorials. • Go from hundreds of mystery folders to a visual view of your videos. • Videos are automatically organized by date. • Easily tag and find by people, places, and events. • Easily make movies in the redesigned Quick Edit mode, which offers a simplified Sceneline that puts your clips, transitions, text, effects, and more at your fingertips. • Twenty Guided Edits offer step-by-step help with creative techniques like glass pane effects and Luma fade transitions. • Automatically bring together the best scenes based on the style of your video with Smart Trim, powered by Adobe Sensei. • Photo and video slideshows and collages are automatically created and delivered to you to highlight memorable moments like birthdays and vacations. Adobe Sensei AI does all the work. • Add stylish titles, effects, transitions, and themes. • Create a dynamic video collage with a mix of photos and videos to show many memories at once. • Share on DVDs (Windows only) and HDTVs. 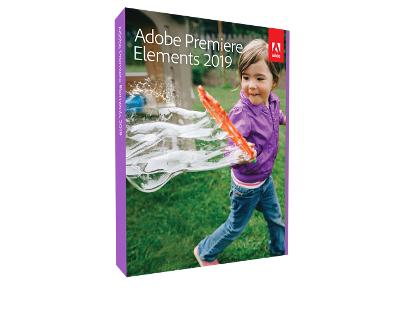 Auto-generated photo and video slideshows and collages are created just for you and delivered upon launch—all powered by Adobe Sensei AI technology. Plus, get up and running quickly—see what’s new since your last version, discover fun things to try, and get inspiring ideas, help, and tutorials. Beautiful photo and video slideshows and collages are automatically created just for you highlighting memorable moments like birthdays and vacations. It’s all thanks to photo and video automation powered by Adobe Sensei AI technology. • NEW Make glass pane effects—Add a video overlay to create a sleek wipe that makes it look like the action in your scene is taking place behind glass. • NEW Create Luma fade transitions—Create a dramatic scene transition by fading in the colors from darkest to lightest. AVCHD (import only), DV-AVI (import/export on Windows), DVD (Windows only), H.264, HDV, MPEG-1 (import only), MPEG-2, MPEG-4, MP3, QuickTime (limited codecs), Windows Media (Windows only), and many more.